1) What contribution will Fiat make to Chrysler that will enable them to be more competitive in the car market? Few brands have consumer appeal that Mercedes-Benz, but the Daimler/Chrysler combo was clearly not successful. I'm not sure how small European cars will play in a US market with $2 gas. 2) Even if Chrysler repairs it's value proposition, the question of the speed of the bankruptcy proceeding sounds optimistic. Even "quickie" bankruptcies tend to drag on. Lawyers, bankers, accountants all see bankruptcies as the gift that keeps on giving. Also, Chrysler's creditors are likely to be better served by a long bankruptcy proceeding, so I think the administration's plans for a 1 month bankruptcy might be met with some resistance. This is a pretty shocking video of a sub-division of new homes in California being razed. As the story goes, a builder went bust, the bank was being fined daily because there were a number of partially finished homes. The bank figured that it was just cheaper to knock down the homes rather than continue paying the fines and hoping for a buyer to come along. Finally, this might be the quote of the week "Apparently, one of the symptoms of swine flu up here in the States is it makes you buy stocks for no good reason." The markets have taken the surprisingly bad GDP data in stride and are all up over a percent this morning. Here is the logic (or lack of logic) driving the market right now: When a company announces that it lost $5 billion last quarter it might rally because the expectation was for it to lose $5.1 billion. However, when the estimate for GDP contraction was -5% and the actual contraction is -6.1%, it's another cause to rally. We've had many markets like this in past years - 1999, 2003 - they defy all logic and continue to move higher. Eventually, reality rules the day, but that is not the case today. Hidden within the GDP data are some SHOCKINGLY bad statistics. These are not the sort of numbers that signal any sort of rapid turn around. Again, here's my thinking we eventually slow our rate of decline in the economy. Things might even improve a little later this year as the stimulus boosts spending, but I think the best case scenario is that we have an L shaped recovery (we just stop contracting and growth doesn't return for many, many years), and the worst case scenario is a the Lightning Bolt Recession -- we fell off a cliff in 2008, we stabilize for a moment at the end of 2009 and go cliff diving again in 2010. ******* Update: The two critical components of the GDP number that were "positive" were a decline in imports (when imports decline, it's a net positive for our GDP) and a 2% increase in consumer spending. I find that 2% number really troubling. Consumers are getting squeezed left and right, 4 million jobs lost in the last 8 months and somehow spending jumped? The banks and retailers seem to have a different view of the consumer that's still sitting on their hands. I think the government statisticians might be playing fast and loose with their assumptions, but we'll have to wait to look for revisions before we any more info on the consumer spending data. In another stunning sign of Wall Street's disconnect from reality, Citigroup has apparently gone to Washington asking for special permission to pay bonuses to employees that have been wiped out by the collapse of the company's stock. Hmmm, do you think that all of the pensions, 401k, mutual funds, etc, that bought Citibank at $55 will get a little cash kickback to ease their pain of a stock at now at $3? Of course not, but that's the logic being displayed by Citibank. I've said for some time that huge portions of Wall Street pay that was tied to the stock prices of the investment banks would be a problem. If you were a hot shot trader making $1 million in salary and $5 million in bonuses, some 70-80% of that money would have been in the form of stock. If the stock goes from $50 to $5 your bonus went from $5 mil to $500k. Again, this is still substantial money, but for someone planning on having $6 mil, $1.5 mil might be a shock to their system. [...]Citigroup executives say they are worried that employees, who have seen much of their past bonuses, paid largely in stock, wiped out by the collapse of Citigroup’s share price"
Even the job fairs!! 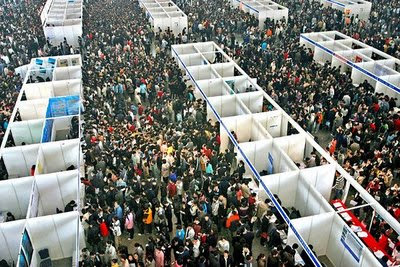 This was the scene at a job fair in China for recent college graduates. As we've seen in the US, a college degree has become little more than a debt accumulation vehicle. Colleges are failing to produce high quality trained employees that can hit the ground running. "Unemployed university graduates used to be rare in China. But now their ranks are ballooning to critical levels just as the country suffers its worst economic slump in two decades. Up to one-third of last year's 5.6 million university graduates are still looking for work, and this year will see another 6.1 million hit the labor market." The markets swung sharply on higher than expected consumer confidence. However, as with most data, the devil's in the details. The bulk of the jump in confidence was due to higher expectations of future improvement - people are keeping hope alive. However, the current situation was basically unchanged and the employment outlook component weakened.
" The American Trucking Associations’ advanced seasonally adjusted (SA) For-Hire Truck Tonnage Index fell 4.5 percent in March, marking the first month-to-month decrease of 2009. The gains during the previous two months, which totaled 4.5 percent, were erased with March’s drop. (February’s increase was revised down to 1.5 percent.) In March, the SA tonnage index equaled just 101.4 (2000 = 100), which is its lowest level since March 2002. The fleets did report higher volumes than in February, as the not seasonally adjusted (NSA) index increased 10.2 percent, but that is well below the 15 to 20 percent range that NSA tonnage usually rises from February to March. In March, the NSA index equaled 104.7." So while you've been hearing anecdotal evidence of a few more shipments here or there, the reality is that seasonally shipping should improve sharply in March/April. We've seen a small uptick but it's not enough to offset the shift in seasonality. Is the Federal Reserve the next Lehman/Bear Sterns? It's interesting to note that while the Federal Reserve has been preventing the banks from falling off the cliff they seemed to have neglected their own balance sheet. As first pointed out on istockanalyst.com there has been a seismic shift in the "assets" and liabilities of the Federal Reserve. According to the Fed's own reports in April 2007, the bulk of the Fed's assets ($787 billion out of $850 billion of total assets - or 89% of assets) consisted of relatively high quality US Government debt - treasuries, t-bills, notes, etc. Two years later? Assets - to use the term loosely - have exploded to over $2.1 TRILLION. Almost $700 billion of new assets include Mortgage Backed securities and term auction credit. Central Bank swaps and commercial paper funding adds another $500 billion. These are shocking numbers. Remember the good old fashioned US treasuries that represented almost 90% of the banks assets? They now represent just 24% of the Fed's assets. Now I know most of your eyes are glazing over so I'll bring in home by focusing in what this all means. Remember the questionable assets that brought down the banks because the banks took out too much debt against too few assets. Well, many of those assets are now on the balance sheet of our central bank. "And the Fed banks are holding total capital of just $45.7 billion against the sum total of $2.19 trillion in assets, meaning the Fed is leveraging its capital 48-to-1. That compares to only 27-to-1 two years ago. Do investors continue to aggressively bid on U.S. Treasuries at our debt auctions? Do foreign creditors, who hold more than 53 percent of the privately held Treasury debt outstanding, start balking at supporting our profligacy? Does the U.S.’s AAA credit rating come under closer scrutiny? And does the dollar start to reflect the fact that the Fed is throwing money around like a drunken sailor — and taking on any and all kinds of crummy assets? " I didn't spend much time this morning reviewing the GM news because there were many other stories moving the markets. I was extremely puzzled by the 20% move UP in GM's stock today. If anyone took their restructuring plan seriously I think you could argue that it means the current stock trading at around $2 per share is virtually worthless. I guess maybe people just read the headlines - job cuts, dealer cutbacks, Pontiac shutdown - and thought, Yeah!! GM will live to fight another day. Perhaps, but it doesn't mean that the stock has any value. Today GM has roughly 610 million shares outstanding, but if their proposed restructuring went through they'd issue 60 billion + shares to bondholders, the US government and the employee benefit fund. That's 100 TIMES the current number of shares outstanding which should in theory make each share of GM worth 1/100th it's current price or $0.02/share. However, since the proposal requires 90% approval from the bondholders I think this plan has zero chance of success. If you were a bondholder would you like to own 10% of GM's stock or take your chances in bankruptcy court? There's a high probability that this plan will lead to bankruptcy filing for GM before the end of June. 1) Yahoo reported that GM's Employee stock fund dumped all of their GM stock. That's not exactly a ringing endorsement of the future for GM's equity. I don't think it's a signal of anything material about the future of GM, but it does seem to indicate that the manager of the fund does not believe that GM is among their best investments they can make right now. 2) Homebuilders are now not just putting fake furniture in houses to avoid the empty look, now they are filling the homes with fake residents. "This $1.2 million seaside pied-a-terre is occupied by Johnna Clavin, a 45-year-old Los Angeles event planner and decorator who has seen business slow. In exchange for giving the townhouse a stylishly lived-in look, she gets to stay there at a steep discount and stands to earn a bonus if the house sells fast. Home "staging" companies charge owners several thousand dollars to fill houses with attractive furniture -- but no human props. Faux homeowners could be the next big thing in staging. They supply "that little extra mint on the pillow," says Steve Rodgers, president of Windermere Exclusive Properties in San Diego, which has the listing on Windward Way. " Ms. Clavin responded to a Craigslist ad placed by Quality First Home Marketing, a San Diego startup. It aims to fill high-end empty houses with occupants who play the part of happy homeowners, in a bid to remove the price-depressing stigma of vacancy. If the place sells in 90 days, she'll earn a relocation bonus, and move on to another empty asset. Ms. Clavin, and her furniture, beat out 46 applicants who auditioned for the homeowner role, says Quality First's owner, Mary Heineke. "I already know they can't afford the house," Ms. Heineke says. "I want to know if they can replicate a person who can afford that house." Showhomes Management LLC, a franchise operation based in Nashville, has 350 "resident managers" living in homes for sale in 46 high-end markets." 3) We finally got word on the not so stressful "stress test" on Friday. As expected, most of the banks will pass this test because the government's expectations for baseline and "worst case" scenarios are so tame. "Real GDP’s average baseline is -2% for 2009 and +2.1% for 2010. The alternative more adverse levels are -3.3% for 2009 and +0.5% for 2010. "In the week ending April 18, the advance figure for seasonally adjusted initial claims was 640,000, an increase of 27,000 from the previous week's revised figure of 613,000. The 4-week moving average was 646,750, a decrease of 4,250 from the previous week's unrevised average of 651,000. ...The advance number for seasonally adjusted insured unemployment during the week ending April 11 was 6,137,000, an increase of 93,000 from the preceding week's revised level of 6,044,000." There are two ways to look at the data. The raw numbers are staggering -- we've not been above 6 million in continuing unemployment claims at any point in the last 40 years. However, as many people have correctly pointed out, our country's population has grown substantially in the last 40 years. As a percentage of total employable citizens we have still seen a sizable jump (up to about 4.6%), but we are still below the peaks of 1982 (5.3%) and 1975 (almost 7%). Unfortunately, I think it's likely to get worse before it gets better. The word that Chrysler is likely to file for Chapter 11 next week, GM's shutting factories, Microsoft cutting cap ex and other spending, etc, etc, is likely to boost anxiety about the economic prospects and probably way on the job market for some time. The market traded within a range today, but there were many, many buyers of the market early as a result of the Apple earnings last night. Many of these buyers bought ETFs that required purchases of stock at the end of the day and thus, the market shot up 70 pts in the last few minutes of the day. Tonight Microsoft reported weak results (sales down for the first time ever), but the stock reacted positively to the news that the company would cut spending sharply. This is theoretically good for Microsoft, but it pokes holes in the "economy is rebounding" theory when a connected firm like Microsoft chooses not to spend through the recession, but is cutting back sharply. As I think we've seen throughout the commentary from the banks over the past few weeks, that much of the slowdown in mortgage delinquencies and foreclosures that occurred from Dec - Feb was tied to a wave voluntary moves by banks and states to delay foreclosures. When those moratoriums expired foreclosures have rebounded sharply. However, data out of Fannie Mae and Freddie Mac shows that even during the periods of foreclosure abatement delinquencies have soared. "Fannie Mae and Freddie Mac mortgage delinquencies among the most creditworthy homeowners rose 50 percent in a month as borrowers said drops in income or too much debt caused them to fall behind, according to data from federal regulators. The number of so-called prime borrowers at least 60 days behind on mortgages owned or guaranteed by the companies rose to 743,686 in January, from 497,131 in December, and is almost double the total for October, the Federal Housing Finance Agency said in a report to Congress today. " I'm not enough of a science fiction buff to draw a better parallel, but Time Warner's moves in North Carolina seem to indicate they reside pretty squarely on the dark side. According to Engadget, Time Warner is lobbying the North Carolina legislature to ban Community based internet/cable providers like Greenlight which is a city owned internet/cable/phone provider in Wilson, NC. *$170 for every single channel including premiums and 20Mbps up/down internet. Time Warner's plan has fewer channels and less bandwidth for an "introductory rate" of $137. Time Warner argues that it can't compete with community-owned services that sell their services for cost. What's next Wal-mart suing to stop me from growing my own tomatoes because they can't compete with my cost? Disney suing to stop me from enjoying my home rather than vacationing at Disneyworld? I love that word. It implies that the nations bankers are not much better than gangsters - extorting money from your grandkids to keep their house of cards erect. The NY Times did a great job cutting through the clutter that has surrounded the many bank earnings to date. As we've seen with each report, Goldman, Wells Fargo, Citigroup, and Bank of America - there has been an accounting sleight of hand in each report. "Another day, another attempt by a Wall Street bank to pull a bunny out of the hat, showing off an earnings report that it hopes will elicit oohs and aahs from the market. Goldman Sachs, JPMorgan Chase, Citigroup and, on Monday, Bank of America all tried to wow their audiences with what appeared to be — presto! — better-than-expected numbers. But in each case, investors spotted the attempts at sleight of hand, and didn’t buy it for a second. With Goldman Sachs, the disappearing month of December didn’t quite disappear (it changed its reporting calendar, effectively erasing the impact of a $1.5 billion loss that month); JPMorgan Chase reported a dazzling profit partly because the price of its bonds dropped (theoretically, they could retire them and buy them back at a cheaper price; that’s sort of like saying you’re richer because the value of your home has dropped); Citigroup pulled the same trick. Steven Roth, professor of management at the Tuck School of Business at Dartmouth College, also pointed out that Bank of America booked a $2.2 billion gain by increasing the value of Merrill Lynch’s assets it acquired last quarter to prices that were higher than Merrill kept them. I can't believe that the banks don't realize that playing loose with accounting rules and creating fictitious profits were what created the financial crisis of 2008. It seems like they've learned nothing in the last 12 months other than "if we get in trouble, the graduating class of Harvard 2054 will be happy to bail us out." 1) The Banks - the profits that are being reported are almost all tied to trading activities at their investment arms. The banks took more risk in the first quarter and their trades mostly worked out. Traditional banking activities continue to weaken and the talk that the banks might need another $200 to $400 billion this year isn't helping their cause. 2) Tech - large technology companies seem to indicate that any "uptick" in demand (like Texas Instruments saw in some segments last quarter) was tied to inventory reductions and not an change in end user demand. This trend has been playing out across the tech sector in early reports and I think as people begin to realize that the green shoots Fed Chairman Bernanke sees might really be mold growing on last year's hay. The momentum players had become exceedingly bullish last week which is usually a contrarian indicator that things may be about to change in the near-term. We'll see how things play out the remainder of the week. The author of this piece put forth some provocative thoughts on what big picture issues we're facing as a nation. I don't think agree entirely but it's an interesting list. "First, why do we let people retire too early and then expect them to live so long without working? In 1910, the average retirement age in the United States was 74. In 2002, however, the average retirement age was 62. Average life expectancy in 1910 was around 55, while in 2002 it was 77. Throughout most of our nation's history, people were expected to work regardless of their age. Only over the last several decades has that changed. Now it is assumed even if you are completely able-bodied and able-minded, you don't need to work and indeed you shouldn't be required to do so if you reach a certain age and certain number of years at one job. But that is crazy. We can't afford it. As people live longer, they should work longer, be productive longer, pay taxes longer, and be full participants in our nation's economy longer." As a nation we live longer (at least for now, until Applebee's and SuperWalmart put us all in an early grave) and retire sooner. With an aging population, declining birth rates, stricter immigration, etc, this is a recipe for long-term financial chaos. Second, why do most Americans spend so much of their health care expenditures in the last three months of their life? Fully 27 percent of Medicare is devoted to spending on end-of-life health (in other words, health care that doesn't work), according to the Journal of the American Medical Association. Intensive care costs comprise 30 to 40 percent of hospital spending and may continue to grow as the population ages." As a nation, we need to have an honest discussion on the value of end of life care. If 27% of Medicare costs are going to services that in effect don't work we need to rethink the system. Perhaps, develop some form of pain management to ease patient pain at the end, but as our country ages delaying this conversation only increases the likelihood of financial calamity in the future. However, it's also important to note that there are many, many people with a vested interest in making sure the system does not change - hospitals, employees, etc. - so it's not likely that any hard choices will be made. Since, it's my blog, I get to edit out the two additional points that the author makes (too many pay no income taxes and it's more profitable to work for the government than to work in the private sector) which I think are not major contributors to our problems, but demonstrate the author's political slant. There was an article in that pinnacle of business reporting the NY Post over the weekend highlighting that this may finally be the year that sales tax becomes pervasive on online sales as Congress may seek to help states with their budget woes by instituting laws that require the big online retailers to charge sales tax. Hidden deep down in the article is the notice that all consumers are "supposed" to pay the sales tax they owe for online purchases as part of their annual tax return. So if you spend $500 at Amazon.com last year in theory you owe about $40 when you file your taxes. Being married to an extremely honest tax accountant has forced to me to be painfully aware of this little rule for many years. I will say however, that seeing that little sales tax line pop-up on Amazon makes me hesitate for a moment before confirming my payment. I'm not sure how much of an impact it may have on Ebay or Amazon (I think the state of the economy is likely to have a far greater impact) but this will be an interesting debate to follow. If you're a real glutton for punishment consider reading this article at the WSJ which highlights a growing risk to the market caused by the rapid rise of the double and triple ETFs. These funds seek to capture 200-300% of the market move in the underlying index through the use of options. However, these funds are also required to rebalance their portfolios at the end of the day and this is probably leading to some of the sharp swings in the market at 2pm and again at 3:30pm. I think people have devised models to buy (or sell the market) at 2pm depending on what their expectations are for the end of the day action from the ETF's. Leverage once again rules the day! Off-topic, but way back in 2007 Dallas (or LA or Miami) would have been flooded with the new Porsche Panamera. A four door, Porsche with 500hp.....excuse me but I think I just drooled on my laptop. Porsche is sticking with their target of selling 20,000 units in 2009-2010 despite the $120k price tag. One final note on autos. I heard a Cadillac/Hummer/Buick/Saturn dealer on a national car call-in show this weekend. He said that the good news was that in March he was still the second largest Hummer dealer in the US (he's based in Miami). The bad news was that it only took 17 Hummers sold in March to be the 2nd largest dealer. He said Saturn and Hummer businesses were both down 75%+. There were some pretty good reviews of the economy over the weekend. One of the best comes out of Barons and their conversation with David Rosenberg. "We should add that he also stresses that it’s critical for both the economy and the market that payrolls stop shrinking. All the talk about jobless claims “stabilizing” is so much poppycock, he snorts. That number of claims, he notes, is still consistent with monthly payroll losses of around 700,000. As with industrial production, which is also in a vicious slump, employment must stop falling before a recession typically ends. Via Barry R. at The Big Picture - The Russell 2000 small-cap index is up 36% since the March low, outperforming the S&P by almost 10%. The last time the Russell outperformed the SPX was from late November to early January. Two months later, the major averages made new lows. One other warning sign: Over the past five weeks, Rasmussen’s investor-confidence index surged 32 points — unprecedented gains in so short a span. This suggests excessive trader optimism for a sustained equity-market rally. I couldn't agree more about trader optimism. Listening to the traders on Stocktwits you'd think it's 1999 and the tech bubble is raging. As I've been saying the commercial real estate market (particularly the segment with retail exposure) could be the next shoe to drop. Well, today that prediction looks a little more valid with the bankruptcy filing of General Growth Properties, the second largest mall operator in the US with 200 malls in 44 states. One data point does not make a trend, but I'll be watching to see if other real estate companies run into trouble. The IMF warned today that there are "worrisome parallels to the Great Depression". I tend to agree with the IMF's observation that the recession will be long and deep and when recovery comes it will be sluggish. The IMF tends to be a good neutral read on the global economy --- they're the original no spin zone. Finally, despite all the gloom and doom that seems so pervasive some times, the tech heavy NASDAQ hit a 5 month high today on expectations that Google would blow away numbers again. Well, Google kind of squeaked through the quarter by cutting costs and selling business, but sales fell 3% from the December quarter, the first time in Google's history that sales fell. We'll see what happens tomorrow - remember it's option expiration so there could be lots of crazy swings. Finally, please let me rant for a moment on the concept that the market is a discounting mechanism. Every other commentator on TV is telling us that "since the market is up, it is looking 6-12 mths down the road." Really? How good was the market at predicting the collapse of the banks? How about the housing slowdown? Exactly - the market missed both events. The market is a real-time example of group think (it's the end of the world or everything's coming up roses) exhibited by daytraders. This is not exactly news, but the US has been bleeding jobs for about 2 years. By combining county job data with the US map you can really see the areas that have been hardest hit by the recession. You expect the map to turn red in Ohio, PA and Michigan, but the visual presentation of job losses in California, NJ, CT, MA, etc. is a powerful reminder of the state of our economy. I haven't spent a lot of time on the Hacketts story but since the parent company of Hacketts - Seaway Valley Capital Corporation - is a public company I thought I'd just take a look at their latest filing with the government. Clearly, this is a complex situation and I only looked that latest filing on 4/13 (link here), but the one thing that jumps off the page is the convoluted capital structure of such a tiny company. The Seaway Valley corp has over 1 TRILLION, yes with a T!! - common share equivalents outstanding. That's so ridiculous that it's laughable. I can't ever remember seeing a company with more than a few billion shares outstanding. The company is now proposing to do a 1 for 1,000 reverse split (if you had 1,000 shares of the old Seaway Valley, you'll get 1 share of the new company) so that it's outstanding shares will fall to "just" 1.2 billion, and they'll have 8 billion shares available for future acquisitions. This gets a little detailed but the bulk of the shares outstanding seem to be due to a preferred stock issuance to a Mr. Scozzafava --- "100,000 shares of Series E Preferred Stock, par value $0.0001 per share, all of which were outstanding on the Record Date. The outstanding shares of Series E Preferred Stock were entitled to a total of 1,002,425,142,364 votes on the Record Date – i.e. 10,024,251 votes per share." I haven't followed this story closely enough to have any real insight (other than enjoying Hackett's selection of North Face products) but since I've recently talked about what an insane number a TRILLION of anything is, I thought I'd pass along that nugget. Like I've said before, you can go broke being right. Right now the market is being told there are two drops of bacteria filled water in the glass and the market views it as half full of crystal clear spring water. It's wrong, but don't lose your shirt trying to fight it. Consider that today the Fed Reserves Beige book reported that 5 of the 12 regions noted that the deterioration of economic conditions slowed. Now, this means that 7 of 12 regions saw the same rate of deterioration or acceleration of the deterioration, but let's not get confused by the facts. Also, note that these Fed regions said that the rate of deterioration merely slowed. 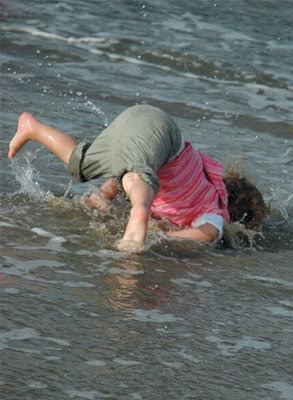 This fits with the analogy that the economy has fallen off a cliff and we're now tumbling down the mountainside. We're still going downhill just at a slower rate (for now - more on this in minute). The rate of decline in economic activity was so substantial last year that math dictates that it has to slow. I'm still of the opinion that at some point in 2010 the economy will make a false start as a result of some stimulus spending. However, I'm also increasingly convinced that we're facing the strong possibility of a double dip recession in 2011-2014 (like 1937-42). I'll try to discuss my rationale for that thinking at some point next week. The market also got excited today when word came out from the National Association of Home Builders that their index hit a six month high of 14. Just for a little context, when the Home Builder index is at 50 the index indicates an equal number of builders find the market poor as those that find the market good. A number of 14, while admittedly better, is still indicative of a terrible housing market. There also was some surprisingly strong housing data out of California today. "A total of 19,486 new and resale homes sold in Los Angeles, Riverside, San Diego, Ventura, San Bernardino and Orange counties last month. That was up 27.9 percent from 15,231 for the prior month, and up 52.1 percent from 12,808 for March 2008, according to MDA DataQuick of San Diego." "Regionwide, foreclosure resales accounted for 55.4 percent of March's resales activity, down from a revised 56.7 percent in February and up from 35.7 percent in March 2008." Foreclosure resales accounting for 55% of sales!?!?!! Also, the sales seem to be concentrated in the very low end of the market as FHA mortgages accounted for 37% of all mortgages (up from just 10% last year). I think it's going to be important to start focusing on total value in the housing market. If 2 houses sell for $500k in 2008 and then in 2009 5 houses sell for $150k, has the market rebounded? I'd argue that the total value of the transactions is down 25% ($1 mil vs. $750k) and thus, the market is not as healthy as it would appear if you looked at just units (2 vs. 5). As I've noted the two big shoes that may be ready to drop are credit cards and commercial real estate. Today some really bored investors tore through a giant SEC filing from Capital One (the "What's in your wallet?" people) to find this nugget. The annualized rate of charge offs now exceeds 9% and jumped over a full percentage point in March. This seems to reflect the growing problems facing the US consumer as unemployment continues to soar. What if your stress test was like eating an ice cream sundae? Everyone that's ever had to endure an actual stress test at their cardiologist knows the challenges they present. However, imagine the joy of a stress test if they took out the walking, the treadmill, the wires, added a chair, soft music, mood lighting and offered you unlimited ice cream sundaes? You'd probably keel over from a massive coronary in 15 minutes, but your stress test results might show that you'd passed with flying colors! Well, that brings us back to the bank stress tests. It seems that Mr. Market finally caught onto Wells Fargo's accounting slight of hand and Goldman's missing month and the markets have struggled so far this week. Intel's earnings might garner the bulk of the press tomorrow but don't be surprised if talk that the "stress test" results coming out gets people revved up again. Another convenient leak hit the NY Times tonight........US planning to reveal data on health of top banks. However, the game is rigged. The economic data that the FDIC and the Treasury uses in their base forecast and adverse conditions forecast have already been surpassed!! The trend in unemployment indicates that conditions at the end of 2009 may be WORSE than the government's worst case scenario for 2010. Like any good analyst can tell you, the output of your model is only as good as your inputs. Garbage in, garbage out. So while the government seeks to soothe the market's concerns about the banks by showing that all is happy days at the banks, investors in the know realize that the reality is banks face a weak environment that is probably getting worse (albeit at a slower rate) not better. In fact, foreclosures have resumed sharply since 4/1 -- why you ask? 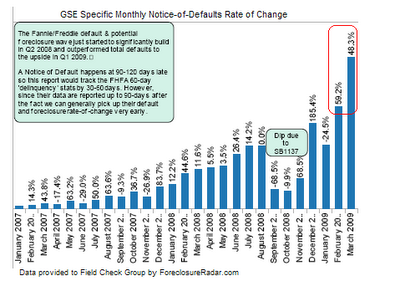 The administration asked the banks and Fannie/Freddie for a moratorium on foreclosures in Q1. That moratorium has expired and the banks are making up for lost time. Alpine, NJ is not a township that most Americans are familiar with but it's long been known as the wealthiest town in the wealthiest state. It's small enclave full of mega mansions that caters to the really, really wealthy. With just over 2,000 residents it was tied with Miami Beach as the most expensive zip code in 2007. "CC Sabathia consoled himself after his first abysmal game by spending $15 million on a six-bedroom house in Alpine, NJ, reports The Post's Jennifer Gould Keil. That's spare change for the 250-pound, 6-foot-7 ace, who signed a $161 million contract with the team in the off-season. The 12,000-square-foot mansion on 2 acres was on the market for less than two weeks." Goldman's clearly feeling very confident in its ability to maintain its role as masters of the universe. Substantial profits and they want to give the TARP money back ASAP. Perhaps the most interesting tidbit is the giant reserve for employee compensation. $4.7 billion or 50% of revenues (over $168k PER EMPLOYEE!!). Think Goldman's hiring, because I'd like to get a piece of the pie??? "Goldman Sachs posted a $1.7 billion profit today — and with it, Goldman set aside $4.7 billion for salaries and bonuses. That $4.7 billion is 50% of Goldman’s revenues for the quarter, a jump up from the same time last year, when salary and bonuses accounted for 48% of Goldman’s revenues. In essence, things are still ugly in the market — but even so, Goldman actually said it would reserve more money for staff salaries in the first quarter than it did last year. Now Goldman is the first big bank to rush to pay that TARP money back with a $5 billion capital-raise. It makes sense: without TARP funds to worry about, Goldman does not have to pinch pennies excessively or prepare itself for 90% bonus taxes. " If any investment bank survives the downturn intact it should be Goldman. They dominate every aspect of the banking world (and some would argue the political world as well). "There is a rumor about Goldman Sachs flying around on the street - allegedly they are about to report their second-best quarter in history, +$12 billion or so. Gee, you don't think being paid by the taxpayer through AIG's "conduit" for losses that didn't (yet) happen at 100 cents on the dollar might have anything to do with that, do you? And further (and potentially much worse) there is the repeated statement by Goldman executives that they were "fully hedged" against a potential counterparty default by AIG. One wonders - was that "hedge" to be short the equity on AIG itself, perhaps? Because if that's how Goldman hedged they got paid twice and the taxpayer literally got robbed." This is fairly complex, but the government has funneled billions into AIG that flowed through to their counterparties (mainly Goldman and other big banks) to cover them for "potential" losses. If, as Goldman has suggested, they were fully hedged (ie, had insurance against losses with AIG) then Goldman and the other banks may have made a profit on AIG's collapse and also enjoyed a windfall as billions flowed from you the taxpayer to Wall Street. It's good to be the king. I don't believe anyone in Congress could decipher this series of transactions, but a group of good forensic accountants and laid off Lehman/Bear Sterns traders probably could. If we're offering $50 million for OBL, I think it's fair to at least offer up $5 million to anyone that can succinctly interpret the data regarding the AIG/Goldman situation. This could be someones Woodward and Bernstein moment if they seized the moment. Oh, remember how I cautioned last week not to get to giddy about the Wells Fargo news because they still operate in that sinkhole called California? Wells Fargo's decision to play loose with the facts is likely to come back to haunt them. I won't be surprised if their press release of 4/9/09 proves to be the basis for some fairly significant shareholder lawsuits one day. "More than 400 of the 2,000 largest malls in the U.S. have closed in the past two years. The last new major mall in the U.S. opened in 2006, and only one big mall is scheduled to open this year—the troubled Xanadu mega-mall in Rutherford, N.J. With some 150,000 retail stores projected to fail in the U.S. this year, more mall closings are imminent." I think that when you look at the volume of new, empty retail real estate available in Watertown it is apparent that anything short of a historic economic recovery is going to lead to substantial woes for the owners of these properties. In a related tax story how long before we're charged "accident response fees"? "After her sport utility vehicle sideswiped a van in early February, Shirley Kimel was amazed at how quickly a handful of police officers and firefighters in Winter Haven, Fla., showed up. But a real shock came a week later, when a letter arrived from the city billing her $316 for the cost of responding to the accident. Such cash-per-crash ordinances tend to infuriate motorists, and they often generate bad press, but a lot of cities are finding them hard to resist. With the economy flailing and budgets strained, state and local governments are being creative about ways to raise money. And the go-to idea is to invent a fee — or simply raise one." I'm not sure how I didn't see this coming. Federal tax receipts are down and continue to fall sharply. This is a problem that I hadn't really fully appreciated until I read the 2 page pdf from the Congressional Budget Office. Given the skyrocketing spending tied to TARP, other bailouts and the stimulus, I had focused on the expense side of the government's ledger. However, the weak economy has led to a sharp reduction in tax revenue from corporations and more refunds to corporations and individuals. I think if unemployment continues its march toward 10%+ we will continue to see the Federal government's budget be strained and it will be interesting to see how much appetite the world has for good ole fashioned Made in America debt. "Receipts in March were about $125 billion, CBO estimates, $54 billion (or 30 percent) lower than receipts in the same month in 2008. Net corporate income tax receipts account for more than half of the decline, falling by about $29 billion (or 90 percent) from their level in March 2008." In another example of interesting timing there was an enormously important report that was released on Thursday night long after the markets had closed for the holiday weekend. The details aren't terribly important unless you are active in the mortgage market, but Moody's downgraded 4,988 tranches of jumbo mortgage backed securities with an outstanding value of $170 billion +. Jumbo mortgages were typically issued for homes costing in excess of $500k and they typically were reserved for the best borrowers. "The rating agency says that during the last six months, Jumbo mortgage loans backing 2005 to 2008 securitizations have shown substantial increases in serious delinquencies and decreases in prepayment rates — levels that are unprecedented for this asset class. Borrowers who are 60 or more days delinquent on their payments, have had foreclosure proceedings started against them or properties that are held for sale comprise 1.6%, 2.9%, 3.6% and 3.75% for the 2005, 2006, 2007 and 2008 vintages respectively. Moody’’s is estimating that eventual default rates for borrowers who become seriously delinquent by end of 2009 on jumbo pools from 2005, 2006, 2007 and 2008 vintages will be 2.3%, 3.9%, 5.0%, and 6.2% respectively." Keep this in mind the next time you hear a big bank talk about how great their business is --- They've got a lot of mortgages getting worse not better. Commercial real estate is starting to crack. Stop me if you've heard this one before. It's important to ignore the market on some days and focus on the mundane data. "The number of Americans filing first-time claims for unemployment insurance exceeded 600,000 for a 10th straight week and the total collecting benefits increased to a record, signs the labor market remains weak. First-time jobless claims fell by 20,000 to 654,000 in the week ended April 4, from a revised 674,000 a week earlier that was the highest since 1982, the Labor Department said today in Washington. The number of people staying on benefit rolls rose to a record 5.84 million in the prior week." I think the best analogy I've heard is that the economy jumped out of an airplane last fall and it was in free fall for the last six months. At some point in the last six weeks we've probably pulled the parachute. Does that mean we've recovered? Of course not, it just means we're falling at a slower rate. Continuing claims for unemployment are at 5.8 million! 10 straight weeks of 600k + people filing for unemployment. These are staggering data points. "The weaker trajectory of real output resulted in the projected path of the unemployment rate rising more steeply into early next year before flattening out at a high level over the rest of the year." So the Fed Reserve now predicts higher sustained unemployment through the end of 2010. That's real news. "The information reviewed at the March 17-18 meeting indicated that economic activity had fallen sharply in recent months. The contraction was reflected in widespread declines in payroll employment and industrial production. Consumer spending appeared to remain at a low level after changing little, on balance, in recent months. The housing market weakened further, and nonresidential construction fell. Business spending on equipment and software continued to fall across a broad range of categories. Despite the cutbacks in production, inventory overhangs appeared to worsen in a number of areas. Both headline and core consumer prices edged up in January and February…. Labor market conditions continued to deteriorate. Private payroll employment dropped considerably over the three months ending in February." First let's cover this weird pre-announcement from Wells Fargo. My first issue is with their use of the term Record First Quarter Earnings. They added about 40% more assets when they bought Wachovia. Last year Wells Fargo made 60 cents per share, and the have preannounced 55 cents per share, so while it's technically true that the bank may have made a record dollars, it is not a record profit to shareholders. After quickly reviewing the limited data from Wells Fargo there isn't much that jumps off the page outside of the fact that they appear to have done a TON of refinancing business (make sense as mortgage rates tanked). Refinancing is historically sporadic revenue that is not consistent enough to benefit a company in the long haul, but today it won't matter this stock is going to rocket. Eventually, when the actual data is released in May we might find out that there's a little old man pulling the levers behind the curtain, but today let's all hail the powerful OZ. I'm still very wary of Wells Fargo because of their exposure to the weakest real estate markets (CA and the Southeast). I think the powers that be weren't happy that all of their attempts to goose the market weren't working (Uptick rule had virtually no impact), so it's been "leaked" that all 19 banks undergoing stress tests will pass those tests. I'm not a tinfoil hat guy, but the increase frequency of positive stories leaking to the press is disturbing. The Treasury has not set sufficiently high standards and of course the banks are going to pass. Their standard for worst case scenario is much closer to my baseline expectation. Walmart painted a rosy picture as well, but noted that sales will be below expectations. They blamed the shift of Easter from March to April --- this has always been a pet peeve of mine. Did it suddenly shock some analyst or the CFO of Walmart that Easter is in April? Of course, not. So they built their models assuming Easter was in April. When sales come in light, they blame the shift of Easter. Retail sales look very dismal and frankly, this is a much bigger story than the banks playing accounting games, but again it won't matter today. You can go broke being right. "During World War I, Americans were exhorted to buy Liberty Bonds to help their soldiers on the front. Now, it seems, they will be asked to come to the aid of their banks — with the added inducement of possibly making some money for themselves." Seriously, is anyone in Washington working or do they just sit around developing "plans" to be leaked to the media each night? "The funds, the thinking goes, would buy troubled mortgage securities from banks, enabling the lenders to make the loans that are needed to rekindle the economy. Many of the loans that back these securities were made during the subprime era. If all goes well, the funds will eventually sell the investments at a profit. But, as with any investment, there are risks. If, as some analysts suspect, the banks’ assets are worth even less than believed, the funds’ investors could suffer significant losses. Nonetheless, the administration and executives in the financial industry are pushing to establish the investment funds, in part to counter swelling hostility against the financial industry." I can't believe we are still having this discussion. THE BANKS HAVE PLENTY OF MONEY TO LEND. They are choosing not to lend because they know their remaining assets are partially garbage and FRANKLY, THERE IS VERY LITTLE LOAN DEMAND. Americans are finally adjusting to a less leveraged life and that means less demand for loans. This is ok. The sun will rise tomorrow. Unfortunately, Goldman, Citi, Wells Fargo, etc, think the end of the world is coming if they can find a sucker.......I mean "investors" to overpay for their garbage. As I mentioned way back in September 2008 in this post ---- A real proposal to solve the crisis --- rather than making investments in broken banks we should offer a real FDIC backed 12 mth CD paying a real rate and you'd have plenty of capital. "If banks were to offer one year CD's paying say 7% and a national campaign was launched to encourage purchase of CD's as a patriotic act (like the old War bond commercials) money would flood the banking system (and while we're at it let's bump the insurance on these CD's up to $500,000). Yes, you say, but banks would get killed paying 7% interest for a year. Here's where the government can play a role - the government could make up the difference between the market rate (about 4.5%) and the above market rate (in this case 2.5%). If the US citizens deposited a whopping $1 Trillion in 1 year CD's, the cost to the government would be $25 billion. The banking system would be saved, you and I would earn a decent return, capitalism can flourish again and American can regain it's status as a global financial power thanks to some creative thinking. Unfortunately, we're going to proceed down the path of a bailout for the banks that has no guarantee of increasing liquidity and will likely lead to lower confidence in our US corporations." "The U.S. Treasury Department plans to extend the Troubled Asset Relief Program to certain life insurers, The Wall Street Journal reported on Tuesday, citing people familiar with the matter. The Treasury is expected to announce within the next several days the inclusion of life insurers that are bank holding companies or own a thrift, the Journal reported on its website. Several life insurers have applied, including Prudential Financial Inc, Hartford Financial Services Group Inc and Lincoln National Corp, the Journal reported." A lot of people are wondering why the insurers would need a bailout, but you should know that insurance companies are investment firms in sheeps clothing. They take your premium, invest it, payout a death benefit (or other benefit) and keep the difference for themselves and their shareholders. When they don't make good investments they can't afford to payout the death benefits and need a bailout. I see the argument that life insurance policyholders are similar to bank depositors and if we're bailing out the banks, we can't stop at the insurance companies. However, a substantial piece of business at companies like Hartford, Prudential and Lincoln National is investment management. I'm concerned that we're bailout out investors that bought "annuities" and other investment contracts. If the insurers aim to use any bailout funds to make their investors whole, I would be strongly opposed to using taxpayer dollars for that purpose. You took a risk that Prudential or Hartford was better at managing your money than you would be. If they failed at managing that money, sorry, but that's between you and Hartford leave Johnny taxpayer out of it. This is a critical distinction that I hope is clarified in the next few days. Sounds like Moody's is tired of being the poster child for missing the housing bubble. I think they want to make sure they aware of any seismic shifts in the economy and putting every local government in the US on creditwatch is one way to stay in front of the curve. "Moody’s Investors Service assigned a negative outlook to the creditworthiness of all local governments in the United States, the agency said Tuesday, the first time it had ever issued such a blanket report on municipalities. (Since many of my readers are in Upstate NY - Think about how many factors are waying on NY - falling housing prices downstate, industries leaving upstate, Wall Street's problems lead to lower tax revenues, etc, etc. It's not a pretty picture for NYS). Fed Chairman Bernanke suggested that instead, Congress could consider setting up some other form of assistance for municipalities unable to restructure or refinance their debt, like a federal bond reinsurance program." A few months ago I suggested that we've become a Bailout Nation and watch for bailouts coming for life insurance (check), housing (check), credit card companies (not yet) and even local municipalities (not yet, but Chairman Bernanke seemed to be suggesting a bailout for municipalities). "In these uncertain economic times, many companies have had to let good people go. If you were one of them, you might be wondering how to advance your career in this challenging global job market. Free Online Training: On-demand training available 24 hours a day, 7 days a week." Lots of companies could build strong bases of users and experts by offering free classes to the newly unemployed. Microsoft, Cisco, SAP, etc could set up free training for the unemployed looking to gain a new set of tech skills. This is barely a blip on the radar in the daily deluge of millions, billions and trillions tossed around but consider how shockingly bad things must be for the the IMF to change their forecast by nearly 80% in 3 months!! "Toxic debts racked up by banks and insurers could spiral to $4 trillion (£2.7 trillion), new forecasts from the International Monetary Fund (IMF) are set to suggest. The IMF said in January that it expected the deterioration in US-originated assets to reach $2.2 trillion by the end of next year, but it is understood to be looking at raising that to $3.1 trillion in its next assessment of the global economy, due to be published on April 21. In addition, it is likely to boost that total by $900 billion for toxic assets originated in Europe and Asia. " If you wonder why the US gets the bulk of the blame for the global meltdown, just look at those numbers - out of $4 trillion of possible toxic assets 75%+ originated in the US. Yikes. A trillion seconds? That would have been about 29,579 B.C. when Neanderthals were roaming Europe and the last ice age was still covering my house with a mile of ice. 4 trillion seconds ago? The lower paleolithic age was becoming the middle paleolithic age about 94,000 B.C., AKA THE MIDDLE STONE AGE. I won't spend much time on the uptick issue, but just know it's another tool of the SEC to eliminate a nature market and create an artificial market. The SEC is planning to announce on Wednesday a reinstatement of the uptick rule or some modification that will curtail the way short sellers operate. "One includes reinstating the "uptick rule," a Depression-era rule abolished by the SEC in 2007 that prevented traders from short selling unless the price of the stock from the most recent trade was higher than the previous price. Short selling is the sale of borrowed shares by an investor hoping to profit by buying an equal number of shares later at a lower price to replace the borrowed stock. The rule was abolished after several studies showed it had little effect. " Remember the ban on short-selling last summer? That also had no meaningful impact on the markets, but they tried it anyway. This is likely to goose the financial stocks and the market as a whole, until someone realizes it's just another meaningless PR move. Consider the inverse of this uptick rule - what if you had to wait for a stock to move down before you could purchase it to prevent irrational spikes in share prices? Of course that would make no sense. Either way be aware that the market is looking for some kind of news and like the FASB "Alice in Wonderland - Mark to Market" rule it could spark a little buying interest today and tomorrow. Back in the reality based world - Confidence among US CEOs fell to it's lowest level in 7 years in the first quarter. The latest reading showed confidence at -5 (confidence ranges from -50 to 150 - anything under 50 signals weakness). "By margins of at least two-to-one, executives said sales, investment and employment would drop over the next six months." I'll note however that CEOs tend to lag the real-time results of their companies. They tend to stay bullish and bearish on their own businesses for far to long at inflection points. Among the many weekend surprises announced in recent weeks, nothing moved the markets as wildly as Fed Chairman Bernanke's decision to force rates lower by buying US treasuries via a $300 billion plan. Well, that seems to have fooled everyone for about two weeks as t-note and bond rates have ticked back up to just about the level where they were when Bernanke announced the plan. Why do you care? Well, mortgage rates are based on the 10-year t-note yield. As that note has rebounded in the last week mortgage rates have risen as well - back over 5% for most 30 yr fixed rate loans. Still a good rate, but not as good as the 4.75% numbers that were out there last week. This snapback has surprised me, but I think the market has realized that $300 billion, while it sounds like a big number (and it is) - it's swamped by the $2+ trillion of new government debt issuance that is expected. In short, the Fed Reserve can't fix the price with "only" $300 billion. "Ten-year note yields increased 15 basis points last week, pushing back towards levels last seen before the Fed surprised markets after its last policy meeting by announcing it would purchase $300 billion in Treasuries in the following six months. "The Fed's problem is that the market realizes that $300 billion in Treasury buybacks is just a drop in the bucket compared to $2.5 trillion in estimated net Treasury issuance this fiscal year," said strategists at UBS Securities. The fiscal year ends in September." I don't get too worked up about George Soros and his comments because he's usually just talking his position. By that I mean, if he owns ice cubes he'd talk up the signs of global warming in Australia, but if he buys oil he will tell you about the threat of a new ice age. Most traders/analysts/commentators do this - they have a specific opinion on the markets and their trades reflect that position. That's why most people talking on CNBC, etc, are just white noise. They provide little real value because they view the world relative to the positions they hold in their portfolio. Anyway, Mr. Soros will likely get a little attention for comments made late Monday on Reuters Television. "The U.S. economy is in for "a lasting slowdown" and won't recover this year, while "the banking system as a whole is basically insolvent," billionaire investor George Soros told Reuters Financial Television on Monday." Finally, I forgot to mention this last week. This is so stunning it's hard to believe the banks would be this bold. "US banks that have received government aid, including Citigroup, Goldman Sachs, Morgan Stanley and JPMorgan Chase, are considering buying toxic assets to be sold by rivals under the Treasury’s $1,000bn (£680bn) plan to revive the financial system. The plans proved controversial, with critics charging that the government’s public-private partnership - which provide generous loans to investors - are intended to help banks sell, rather than acquire, troubled securities and loans." So consider a bad asset on Goldman's books. They think it's worth $5 billion, but the market says it's worth $1 billion. Citigroup could take a nice piece of their bailout money, coupled with loan guarantees from the FDIC and offer to buy the asset from Goldman for maybe $3.5 billion. It's three card monte where Goldman wins, Citigroup wins and you and I pay more taxes. Someone (Congress, the Treasury, FDIC, the Fed) needs to change the PPIP to make sure any bailed out financial firms do not bid on the assets of the other bailed out firms. No wonder the banks have been rallying - they keep changing the game midstream. A number of people are starting to point out the remarkable similarities of the current rally to the last great burst in the markets way, way back in November 2008. 1) It will probably make banks more reluctant to sell their bad assets, delaying any rebound in lending. Remember the last big rally also occurred in the vacuum of information - the last month of a quarter when companies stop publicly commenting on their business activities. When companies began reporting earnings in Jan/Feb, their comments drove the markets to new lows. I'm not suggesting that the pattern will repeat, but the early commentary from companies reporting earnings has been remarkably dire. One mid-size software company reported $18 million of license sales in Q1 2008. That number fell to $4 mil in Q1 2009. Again, one company doesn't make a trend, but it's something to watch out for in the coming weeks. Consider this stunning chart (via www.thechartstore.com) that shows how the S&P 500 is still down 40% despite an 8%, 9%, 15%, 9%, 24%, 27%, and 27% rallies in the last 18 months. Skilled traders have been able to play both sides - ride the rallies, short the sell-offs - and are flourishing, buy and hold has been a painful game plan. Also, consider the WSJ article - "It's starting to look a lot like November". "The recent stock-market rally is turning heads. Why, there hasn't been anything like it since at least...November. The Dow Jones Industrial Average has bounced 22.5% in 19 trading days, the best such stretch since 1938. The broader S&P 500 has jumped 24.5% during that time. Amid the cheer it is easy to forget that the short-lived bounce off the market's November 2008 bottom was nearly as strong as this one. Until this past Thursday, November's rally was bigger, with the S&P 500 up 21% in 17 days, compared with 20% for the current bounce. The earlier surge carried through to early January, but then fell off a cliff to hit 12-year lows." I won't harp on the jobs data from Friday too much even though I could. While many commentators over the weekend repeated the refrain that jobs are a lagging indicator and shouldn't be watched too closely - there are data points that are useful when looking at the real-time health of the economy. Two of the best figures to follow are hours worked and temporary help. When businesses come out of a downturn, they often lag in their hiring because they can't be sure that the downturn is over. Thus the average # of hours worked/week slowly ticks up during a turn in the economy. However, the average # of hours worked fell to just 33.2 in March, the lowest level ever recorded in the history of the survey (dating back to 1964). Also, as businesses start to recover, it is often easiest to add temporary staff before hiring full-time employees. In March, US employers shed another 72,000 temporary employees. This has been a pretty consistent trend since last year and the trend doesn't seem to be shifting direction yet. With all of this said the Asian markets are still rallying because Bernanke said he thought some progress was being made in unfreezing credit markets.